Greek Default Watch: How Much is Public-Sector Tenure Costing Greece? How Much is Public-Sector Tenure Costing Greece? The Greek government continues its search for €11.6 billion in spending cuts; yet, it has made clear so far that laying off public sector employees is off the table. This is a pity: spreading the pain evenly between the private and the public sector is the best decision that the government could make. Besides boosting its credibility with Greeks who feel they are being suffocated to pay for generous state wages, this decision would yield enormous economic gains. Consider the following table. Admittedly, the data on the Greek public sector remains opaque. But the European Commission, in its review of Greece’s second program, published a table showing public sector employees at year-end 2009 and 2010 and for November 2011 (see here, p. 24). To take the data through December 2011, I have relied on numbers published by the Ministry of Administrative Reform (here). The data shows that public sector employment shrank by some 56,000 from 2009 to 2011, a 7.8% drop (Line 1). At the same time, from Q4 2009 to Q4 2011, total employment in Greece dropped by 544,000, a 12.2% decline (Line 2, sourced from here). If we subtract public sector employment from total employment, we can conclude that the private sector has been hit disproportionately with a -13% drop in employment. On top of fewer jobs are also lower labor costs, which have fallen considerably by 18.5% (Lines 4 and 5, sourced from here). At the same time, the Greek government has managed to reduce its wage bill by almost 15.9% from €31 billion to €26 billion (Line 6, sourced from Eurostat). Given that part of the drop came from employing fewer people, the cost per worker only fell by 8.8% (Line 7). But had public sector costs fallen by the same amount as the rest of the economy (18.5%), the wage bill per person would have been almost €4,000 lower. If we put these two pieces together, we can estimate that if the number of public sector employees had declined by the same amount as private sector employees, the wage bill would have fallen by 19.9%, given the (actual) drop in wages for the public sector. But if wages had fallen further, in line with the economy as a whole, the government’s wage burden would have shrunk by 28.4%. In other words, if the public sector had suffered in a similar way as the private sector, the government would have spent €3.9 billion less in 2011 (€22.2 billion versus €26.1 billion actually disbursed). Given that Greece had a primary deficit of €4.6 billion, the government would have almost run a primary surplus in 2011! Another way to think about this is that the increase in indirect taxes (VAT, gasoline, etc.) has produced a net gain of about €2.3 billion from 2009 to 2011 (calculated as the delta between real revenues in 2011 vs. revenues if the ratio of indirect taxes to GDP had remained at its 2009 level – effectively estimating that the new measures prevented indirect taxes from falling in line with GDP as happened with direct taxes). Greece could revert back to pre-crisis tax levels and still come out ahead. These are huge stakes, and all that they require is that pain is evenly split. No need to wipe out the public sector, just to treat public sector employees like everyone else. Greece would be running primary surpluses if the government could confront public sector employees. And Greeks would see a big spike in their disposable income from lower taxes. So much that can be accomplished with such a simple policy of political courage. 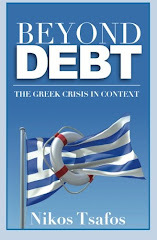 Thank you for providing such balanced, informative and sane analysis on the crisis - otherwise in short supply. But the more clear analysis, the more questions rise. "The governments figures are opaque" Why? And why are we hearing pensions will be capped at 2500 a month when most are not even getting 500? Why are we told that almost 200,000 civil servants have been fired when these figures show otherwise? And are the severance packages just a myth, or do some get them? It's hard to know what to believe. Just simply dividing the top line numbers over total wage bill divided people employed comes out that on average the wage bill per head is over 39000 euros a year. I know a doctor working in a public hospital who was offered 1500 a month. He left to practice in the UK for 5 times the salary. They have to get down to accurate bean counting first. Maybe start voluntarily cleaning the rubbish piled up in Athens. 2- A restraint in corrupt practices in the public sector a major obstacle to investment in the country as exit becomes reality. What this adds up to is: they need to reform the constitution, to be able to do this. And revisions of the constitution is covered in Article 110. And since the last amendment passed in May 2008, this cannot be done before May 2013. But they should announce it now. One of the major deficiencies in the greek civil service identified by the OECD study last year was that it was legally hidebound and so incredibly inflexible, due to the clauses above. Now, those financial folks fully know, from practice alone, that micromanagement of a large organization is the highway to doom. It's a matter of time before the grose stuff hits the fan. But these folks have no understanding of the scientific body of knowledge that may explain WHY micromanagement is wrong. Hence, the anti-micromanagement principle becomes mer common sense, a principle poorly understood and weakened by its particular wording. Like what happens with fundamentalist religious dogma, they might violate the principle and be unware of it, or pretend otherwise. This is easily done by going around the actual wording of the principle. Ending the tenure of civil servants in Greece means the end of the sovereignty of Greece. You can't micromanage a country; you need to spread accountability and responsability, and that can't be done without a large contingent of tenure track public administration positions. Tenure should not be ended, but it should be reformed so that it comes with (and results from) accountability and responsability on the job. Germany or Britain is a good example, here. Note that without a tenured Public Administration, Greece will become a colony, much like what it was under the Turks. This surely won't last. and the experiment will all end horribly both for foreign capital and the Greek nation. From the outside of Greece, OECD, IMF & Co won't be able to control anything; and the Greeks will again have their sovereignty trashed by foreign powers. P is not equal to NP, stupid. The Second Law of Thermodinamics places restrictions on any attempt to control a system formed by a very large number of units when your own leverage is a few variables (whose number is much smaller than the number of units of the system). Some of our guys (researchers) conjecture that it may be related to the P not equal NP conjecture in Mathematics, which has not been sproved yet (there's a millon dollar award on that) but almost every Mathematician believes the conjecture is true. The conjecture puts an unsurmountable (practical) limit on the kind of tasks you can accomplish with information systems and machines (control organizations and computers). "Greece's slow and burdensome bureaucracy is estimated to cost the cash-strapped country a total of 14 billion euros a year, or 6.8 percent of gross domestic product (GDP) -- almost double the European Union average of 3a.5 [sic - I think they mean 3.5 ] percent -- according to conclusions of a recent meeting between Administrative Reform Minister Antonis Manitakis, Development and Competitiveness Minister Costis Hatzidakis and a team from the Organization for Economic Cooperation and Development (OECD) in Athens." oops... should have attributed that.